Yes. Registration is at the race site at Madeira Beach City Hall from 5:30 a.m. – 7:00 a.m.
To receive a refund, deferral, or credit, you must register by September 9, 2018 for the Florida Holiday Halfathon & Relay and notify the race director by email (not Facebook) at least 3 weeks before the race or by November 18, 2018. There are no refunds due to cancellations due to an Act of God, such as weather. No deferral or transfer is available if you do not show up for the race. Online confirmation is also available at Active.com’s registration page, right below the banner, where it says “SEARCH PARTICIPANTS.” If you signed up for the Challenge, your name will not appear in the individual race’s search. Please search on the Challenge/Triple Crown page at Active.com. Email us info@FLRoadRaces.com. In the subject line please put “Missing Registration.” Be sure to include your first and last name that you registered under (maiden name, etc.). Yes. There will be 3 packet pickups before the race, as well as on race morning. Click here for schedule. Yes. You can register for the race at the packet pickups before the race, as well as on race morning. Click here for schedule. If you are picking up for a group, it helps us tremendously if you have all the names written on a sheet of paper. This will expedite the process and keep the line moving. Extra points if they are in alphabetical order! Yes, there will be packet pickup at the race site from 5:30 – 6:45 a.m. Please come early so you have plenty of time to prepare for the start of the race. How do I get to the start line at Madeira Beach? How do I get to the finish line at Taylor Park in Largo? Is there parking at Taylor Park? Yes, there is plenty of parking throughout the park. Will there be shuttle buses to take me back to the start line? Free shuttle buses will operate from 9:15 a.m. – 12:00 noon, transporting finishers from the finish line at Taylor Park back to the start at Madeira Beach City Hall. Yes. Use your packet pickup bag, which has a label for your name and race number on it for your non-valuable items (jacket, gloves, hats, etc.). The bags will be transported to the finish line at Taylor Park. No wallets, cell phones, or other valuables should be put in the bags as we cannot be responsible for missing items. Yes. 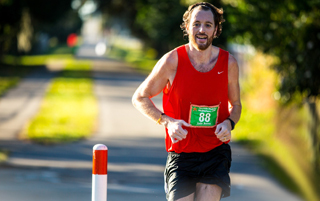 The Holiday Halfathon course is accurately measured and certified by the USATF. To view the course maps click here. Is the Florida Holiday Halfathon a point-to-point course? Yes, our point-to-point course starts at Madeira Beach City Hall and heads north through five, unique beach communities to Indian Shores, before heading inland to Seminole, and north along the Pinellas Trail to the lakefront finish line in Taylor Park. The course is fast and flat. The highest point (Park Boulevard Bridge, four miles into the course) is just 25 feet above sea level, with the rest of the course 10 – 25 feet above sea level. We require that runners and walkers be properly prepared and trained to finish the Halfathon within 4 hours (18 minute/mile pace). Please note that 4 hours after the start, course support (i.e. aid/water stations, volunteers, course marshals, clocks, etc.) is not guaranteed. Walkers expecting to finish slower than 4 hours will be required to start 30 minutes earlier, at 7:05 am. This will give walkers adequate time to arrive at the finish line and will enable us to open the course to traffic earlier, which will keep residents and city officials happy. No. Due to insurance restrictions and liability concerns, only runners, joggers and walkers are allowed. Fresh Florida oranges are available at the mile 6 aid station. Medical support is available from ambulances stationed at mile 2, mile 7, and at the finish line. If you need medical assistance, the ambulances will be mobile and able to respond. Yes, licensed sports massage therapists will have a tent set up and will provide massages in 10 minute increments at $12 per 10 minutes. Results will be posted at our Results Page a few hours after the race. The awards ceremony starts around 10:00 a.m at the post-race party area. Santa will be making his annual appearance. All Halfathon finishers receive a Holiday edition of our unique gold running starfish medals. Thank you for your inquiry! Come be a part of the support system for your running community, and the out-of-towners who join us. Your time, energy and support are invaluable to all of us! Please go to the Volunteers page to sign up. In an effort to give back to our community, we invite small groups to adopt an aid station during each of our races. Any non-profit group of eight volunteers will receive a post-race donation of $200. This is a fun way for running clubs, youth athletic teams, school groups, and other charities to participate in our community events while earning funds for your organization. If your group would like to participate, please register NOW! These are offered on a first-come basis and may fill up quickly. 1) Unlike some other singular-cause events like “Komen Race for the Cure” where all the proceeds go to one non-profit, we donate cash to a number of local, micro non-profits such as running clubs, youth athletic teams, etc. that support our races with their volunteers. 2) We offer direct support to athletes in financial need through our Entry Fee Assistance program. We also invite local elite athletes to participate so they can continue to improve. 3) We often provide comp entries as raffle items for auctions at churches, schools, fundraisers, etc., and we donate modest amounts of cash when our athletes are raising funds for their pet projects. 4) Through our races, we provide exposure to other fundraising events via Facebook post, emails, and our goody bags. 5) Our biggest area of charitable endeavor is to provide our race management services, equipment and time, pro bono or partial pro-bono, to non-profits that stage races. In prior years, we did this for the Partners For Life Police Appreciation Run. Recently, we helped the Celma Mastry Ovarian Cancer Foundation increase participation by 50% for its One Step Closer to the Cure 5K / 10K / 1 Miler. On September 27, we are helping a fellow race director stage her Sunrise Run. We also offer our time or equipment when applicable, such as volunteering at Gasparilla and the St. Pete Road Runners 5K Beach Series. 6) The absolute most satisfying charitable endeavor last season was to create and stage the “Tampa Bay for Boston Memorial Run.” Just about 3 weeks after the Boston Marathon bombing, we hosted 800 athletes in St. Pete for a candlelight vigil and memorial run, raising $15,000 for the victims through The One Fund Boston. As you can see, we LOVE being a part of the Tampa Bay running community and thoroughly enjoy being in a position where we can help in so many diverse ways. We don’t think we’ll ever have a hospital wing named after us, but we take great joy in helping people on a more direct, personal level.